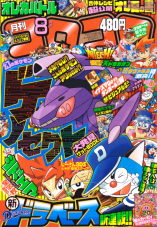 The manga adaptation of Kyurem vs. 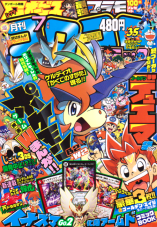 The Sacred Swordsman Keldeo was printed in CoroCoro Comics, a manga anthology magazine that goes on sale around the 15th of every month. Two chapters were printed in the monthly magazine with the last 28 pages of the second chapter debuting in the graphic novel release. The chapter names below are from the graphic novel release. 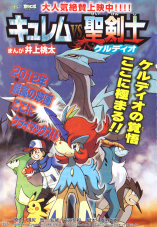 (July 2012) "The Invasion of Kyurem, the Strongest Dragon Pokemon!!" (August 2012) "Resolve Yourself Keldeo!" Chapter One "The Invasion of Kyurem, the Strongest Dragon Pokemon!!" In an abandoned mine, the "Colt Pokemon" Keldeo challenges the legendary pokemon Kyurem to a battle. The trio of Cobalon, Terrakion, and Virizion rush over to try to convince Keldeo that it's not ready yet to take on Kyurem, especially since it can't even use its "sacred sword" (聖なる剣) yet, but the young pokemon ignores them and goes after Kyurem anyway. After Keldeo's horn is broken by one its opponents attacks, the trio go up to Kyurem and try to convince it to stop the fight. Kyurem refuses and, to prevent them from getting in its way, transforms into "White Kyurem" and freezes the trio in a block of ice! Now that there's nobody left to help it out, Keldeo gets scared and runs away. As Keldeo runs toward a set of railroad tracks, Kyurem becomes upset that their battle hasn't been decided yet. Satoshi, Iris, and Dent are riding a train to a town named Roshan. When they get off at the Wind Station (風の駅), Pikachu notices an injured Keldeo jumping onto one of the cars. After the train takes off again, Satoshi climbs to the roof and finds Keldeo lying there unconscious! The pokemon comes to and tells the young trainers that Kyurem is on the way, but none of our heroes know what this "Kyurem" is. Suddenly, the air around them gets cold, signaling the arrival of Kyurem! Luckily, the train enters a tunnel at that moment, preventing the legendary pokemon from pursuing them any further. Now that our heroes are out of Kyurem's range and things have calmed down, Iris remembers that she actually *has* heard of that pokemon before. She recalls how, back at the Dragon Village, the elder told her that Kyurem is known as the "strongest dragon pokemon ever." When the train stops again, Satoshi and his friends take Keldeo to a Pokemon Center. There, Joi deduces that Keldeo's horn was broken by Kyurem. She tells Satoshi that Kyurem coming out of the mine is unusual and that it can only mean that the Keldeo there challenged it to a battle. She goes on to explain how Cobalon, Terrakion, and Virizion are known as the "Sacred Swordsmen" and that Keldeo is training with them to become a member as well. Later, our heroes and Keldeo, who has now fully recovered, take a walk outside. After Satoshi and his friends introduce themselves, Keldeo tells them how it's been training to become a "Sacred Swordsman" like its mentors Cobalon, Terrakion, and Virizion. It wanted to hurry up and challenge Kyurem even though it couldn't use the "sacred sword" yet, so it snuck off in the middle of the night and headed to the mine where Kyurem lives. It then tells Satoshi about how it lost the fight, how its friends were frozen, and how it got scared and ran away. Satoshi tries to convince Keldeo not to give up and offers to lend it their power. As Satoshi and his friends eat dinner that night, Iris recalls how the village elder also told her about how Kyurem can change forms. It gains the power of Reshiram when it becomes "White Kyurem" and gets Zekrom's power when it turns into "Black Kyurem." Suddenly, the air gets cold just like it did on top of the train! A group of Freezio, who Keldeo recognizes as Kyurem's friends, attack our heroes. Immediately after, "White Kyurem" fires off an attack from the sky! It then transforms into "Black Kyurem" and prepares to attack our heroes! What will Satoshi and his friends do!? Chapter Two "Resolve Yourself Keldeo!" Black Kyurem fires off an attack that lands just in front of our heroes, knocking them back. Satoshi and his friends think it's too dangerous to fight there dash into a building, confident that Kyurem is too big too follow them inside. Its Freezio friends, however, can. The Freezio attack Satoshi, so Keldeo fires off two Hydro Pump attacks, one from each of its hind legs. As the Ice-Type pokemon are washed away, Satoshi and the others head back out into the streets and duck behind an alley. What's their next move going to be? Dent says their top priority is rescuing the frozen Sacred Swordsmen back at the mines. He then tells them that they can get out of the city without Kyurem and the others knowing by using the subway. Using his knowledge as a Metro Sommelier, Dent leads everybody out of the city and into a museum of transportation. As Satoshi and Dent look at all the vintage vehicles, Iris spots a blimp that she thinks can still fly. Before long, the roof opens up and the blimp, with Iris inside, emerges from the museum. The Freezio notice the dirigible and fly up toward it. When they finally reach the cockpit, they discover that only Iris and Kibago are onboard! Iris is happy - her plan to lure the Freezio away and buy Keldeo enough time to flee is working! After the Freezio leave, Black Kyurem flies up out of nowhere, glares at Iris for a moment, and then joins the Freezio in resuming their search. Back on the ground, the Freezio notice a handcar coming out of an old train station. They follow it, unaware that this, too, is merely a distraction meant to buy Keldeo enough time to get away. As Dent continues to draw the Freezio away from their target, Satoshi, Pikachu, and Keldeo make a run for it. As it makes its way out of the city, Keldeo thinks back to how both Iris and Dent put themselves in danger to help it rescue its friends. Satoshi looks back at Keldeo and, in order to break up the silence, asks what the three Swordsmen are like. Keldeo tells him about how Terrakion taught it about staying focused, Virizion taught it about overcoming its fears, and Cobalon taught it about how one can turn a defeat into a learning experience. Back on the tracks, the Freezio have figured out that Keldeo is not on the same handcar as Dent and leave him alone. After Black Kyurem flies past, Dent wonders if Satoshi and Keldeo are going to be OK. Eventually, Satoshi and Keldeo arrive at the mines. Keldeo can sense that Kyurem has returned as well and, after remembering what happened the last time it was there, becomes too scared to move. Satoshi decides to go in by himself. Before long, finds the three Swordsmen! As Satoshi and his Pikachu, Charbu, and Gantle work to chip away at the ice, Kyurem approaches Satoshi and demands he stop. When Satoshi refuses, Kyurem fires an attack at the young trainer! Luckily, Keldeo arrives on the scene and deflects the attack with a Focus Blast. Kyurem agrees to let Keldeo enter its lair and battle it once more. Fear begins to overtake Keldeo again, so Satoshi shouts some words of encouragement its way. As Keldeo thinks back to how much it's been helped by its friends - the Sacred Swordsmen, Iris, Dent, Satoshi - it gathers the resolve needed to transform into its Resolution Form! The newly powered-up Keldeo charges into battle, ready to settle the score once and for all! The chapter ends by saying that the story will be conluded in the theaters. A third and final chapter debuted in the graphic novel that went on sale on August 28th, 2012. The title page was printed in grayscale for the graphic novel release. Dent and Iris catch up with Satoshi just in time to see the battle resume. The shockwaves from Keldeo's and Kyurem's continuous attacks crack the ice where Cobalon, Virizion, and Terrakion were trapped, freeing them from their icy prison. Next, Kyurem transforms into Black Kyurem and freezes Keldeo just like it had done to the others! Keldeo's sword grows even bigger and breaks it out of the ice, surprising everyone with the amount of power it now has. Black Kyurem responds by rising up into the sky and firing off yet another electric attack. Keldeo sees that the energy ball is headed toward Satoshi and his friends, so it leaps in between its friends and the attack without any hesitation. Once the smoke from the explosion clears, our heroes see that Keldeo has been knocked down! After Keldeo concedes defeat, Kyurem tells its opponent that it's impressed with how it put its friends before their battle and compliments it on its "sword." It then turns around and disappears into the distance. Some time later, Satoshi and his friends say their goodbyes and take off in the blimp that Iris had used earlier. As our heroes leave the sacred swordsmen's sight, they tell Keldeo that it's made some good friends.